Many people have the day off on July 4th, and that affords a great opportunity to visit some of our local attractions and, at the same time, celebrate our nation's independence. These local Phoenix and Scottsdale attractions have special offers for the holiday. Many of these have an admission charge, but some are free to attend. If they are available, we recommend buying tickets online in advance to avoid long lines at the door. Some restrictions may apply. Prices, dates, and activities are subject to change without notice. They are presented here in no particular order. Rawhide is a western town attraction located near Chandler on the Gila Rive Indian Community. What you can expect: water slides, bounce houses, live musical entertainment, live action stunt shows, unlimited Rawhide attractions and rides, fireworks. What you need to know: gates open at 4 p.m. In addition to ticket prices, there is a charge to park. The Rawhide Steakhouse will be offering a special Red White & Rawhide Buffet complete with holiday favorites, plus top sirloin, St. Louis Ribs, Chili Bar and Dessert Station, priced at $17.95+ per person for adults and $9.95+ for kids. Tickets for the event as well as for the buffet are available online. Bring cash for parking fee. In 2017: Saturday, July 1 from 4 p.m. to 11 p.m.
What you can expect: splash pad, water zones, live musical entertainment on stage, DJ, dancing, games and prizes, beer garden, fireworks. What you need to know: free parking. Bring blankets or lawn chairs, music on two stages. A portion of the proceeds from the beer garden will benefit Fighter Country Foundation, a not-for-profit focused on supporting programs and services at Luke Air Force Base that aid, support and honor Airmen and their families. More than 20 Westgate restaurants and bars will be open, many of which will have “Grab & Go” dining deals. In 2017: Tuesday, July 4 from 5 p.m. to 9:30 p.m. Celebrate July 4th in cool comfort at the Tempe Center for the Arts. What you can expect: food truck, cash bar, view of fireworks over Mill Avenue Bridge and Tempe Town Lake. What you need to know: Pre-purchased tickets include onsite parking. Parking in the TCA lot is not guaranteed for day-of purchases. VIP tickets allow entry into TCA and terrace rooftop for fireworks viewing. General admission tickets allow entry into TCA lobby and ground floor rooms. Queen Creek is located in the East Valley. It is a town, not a city. You'll find it in the southeast corner of Maricopa County. The family-friendly celebration takes place at Schnepf Farms, 24810 East Rittenhouse Road, Queen Creek. That's north of Riggs Road and west of Rittenhouse. Here is a map with directions to Schnepf Farms. Entrances to the event are off Rittenhouse or Riggs/Combs. What you can expect: rides, water slides and splash zones, rock wall, bouncer, live entertainment, hay rides, train rides, petting zoo, games, contests, fireworks. What you need to know: The entrance fee is per carload, can be purchased at a discount in advance online. VIP tickets include dinner in air-conditioned Barn, unlimited ride wristband, bottled water, and prime seating for the fireworks. No coolers, alcohol, fireworks, firearms. Bring water. The rides and water slides will be open from 4 p.m. to 8:30 p.m. The Celebrate America Firework Extravagaza will take place at about 8:45 p.m. Take the free hayride to the area where the rides are located. After the fireworks, the rides will operate until 9:30 p.m. Stay after the fireworks for an outdoor movie. In 2017: Tuesday, July 4 from 4 p.m. to 10 p.m. This party takes place in air-conditioned comfort at WestWorld in North Scottsdale. What you can expect: stunt shows, bull riding rodeo, pony rides, petting zoo, character meet and greets, Kid Zone, fireworks. What you need to know: tickets are available at a discount if purchased in advance online. Kid Zone wristbands sold online. Family Packs available. Scottsdale residents get a discount. Both kids and adult VIP experiences are available, with preferred seating and exclusive access to some activities, as well as food and beverage. In 2017: Tuesday, July 4 from 3 p.m. to 9:30 p.m.
Cave Creek is located just north of Phoenix and Scottsdale, Arizona. Unique shops and galleries, along with a traditional western ambiance, await you in Cave Creek. Harold's address is 6895 East Cave Creek Road. What you can expect: games, live musical entertainment, fireworks. What you need to know: Harold's Cave Creek Corral is a restaurant/bar with both inside and outdoor seating for this event. Free open seating is first come, first serve. Bring cash. Outside barbecue starts at 5:30 p.m. Advance reservations and ticket sales available online. 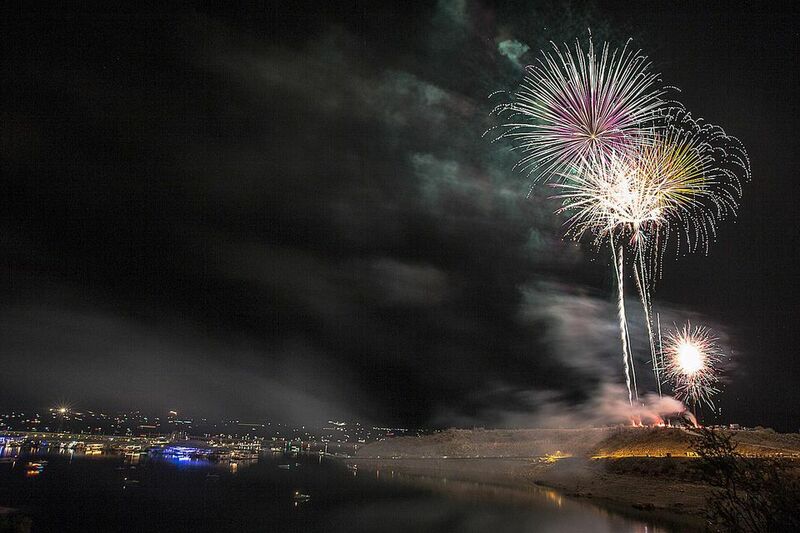 Cave Creek’s fireworks take place after sunset from the hill behind Harold’s Corral. This is a family-friendly event. Wet 'n' Wild is a popular waterpark in Phoenix, in the northwest part of the Valley of the Sun. With cool water fun for all ages, you and your friends or family can spend the entire day enjoying the park, and then stay for the fireworks. What you can expect: water slides, pools, splash areas, fireworks. What you need to know: free admission for all military and first responders (Police, Fire, EMT) on July 4th Weekend, July 1, 2, 3 and 4. Must present valid ID at the ticket window. Up to 6 family or friends may also get in for 1/2 price when a military member or first responder is present and ID presented. Fireworks will begin at approximately 9 p.m. on July 3. The Arizona Diamondbacks celebrate the holiday each year with a huge fireworks show over the stadium — every seat is a good seat! — following the regularly scheduled baseball game. This year they'll be on the road on July 4, but the celebration will take place on the preceding weekend. Chase Field is located in Downtown Phoenix, and is accessible by light rail. What you can expect: fireworks spectacular after the end of the game, included with your ticket purchase. What you need to know: the first 20,000 fans entering the stadium will receive a patriotic tee shirt, courtesy of State Forty Eight. You must have tickets to the game to view the fireworks from inside the stadium. Tickets sold through Ticketmaster. Reminder: parking meters in Phoenix are not free on weekends. In 2017: Saturday, July 1, game starts at 7:10 p.m. Pleasant Harbor at Lake Pleasant is in the northwest part of Maricopa County, in the northern part of Peoria. It is a popular destination for water sports, camping and recreational activities. Here is a map with general directions to Lake Pleasant. There are two harbors at Lake Pleasant. The address of Pleasant Harbor, where this event will take place, is 8708 W. Harbor Blvd., Peoria AZ 85383. That's on the southeastern shore of the lake. What you can expect: bounce houses, music, rides, Kids' Zone, fireworks. What you need to know: There is a per car charge. Lawn chairs and coolers are allowed. Fireworks will be launched from Vista Point. In 2017: Monday, July 3 from 3 p.m. to 9 p.m. The Phoenix Zoo has more than 1,000 animals on exhibit. Gone are the days when it is enough for a zoo to showcase cute or exotic animals. Recognizing the important role that zoos must play, the Phoenix Zoo has been very active in wildlife conservation programs. What you can expect: carousel rides, animal guest appearances, live music and entertainment, bounce house and slide, view of Tempe Town Lake fireworks. What you need to know: catered barbecue dinner at 7 p.m. free carousel rides until 8:30 p.m. Seating will be available in the back of the Zoo at 9 p.m. to view the fireworks. Guests do not need to bring chairs. Not all Zoo trails will be accessible. Animal viewing will be limited. Tickets available online. In 2017: Tuesday, July 4 from 7 p.m. to 10 p.m. Arrive early (beginning at 4 p.m.) and purchase a $10 ticket for a hot dog or hamburger, a soda, a bag of chips. Includes unlimited video game play for all non-redemption games such as the shooting, racing, air-hockey, Star-Wars, etc. until close of business day. This means you may absolutely come back and enjoy more games after the Westgate fireworks show (see #2, above). Pre-purchased tickets will have access to private seating. The cookout takes place on the patio. You may purchase tickets at door based on availability. What you need to know: tickets may be purchased in advance online.